Audiences love musical comedy. Especially if it is a throwback to the musicals of yore. In Cloned!, the old-fashioned musical comedy is in full swing with a classic style score and vibrant characters. What happens when a little accident turns into a comedy of errors that ends up being the best result ever? With music by Adam Spiegel, lyrics by Dan Wolpow, and a book by Jacey Powers and Wolpow, Cloned! is the story of fledgling scientist Wally as he attempts to create the world’s first teleporter but instead creates a telecloner. Set in the year 1993, the Sharon Stone-pining Wally attempts to teleport himself into the shower but accidentally creates a clone of himself and his pigeon Tramell. Through door slamming miscues and evil genius plans, Wally and Clone Wally are accompanied by their assistant, the adorkable Wally-pinning Izzy, super stoner roommate Fizz, evil genius mentor Dr. Marshall, Korean landlord Mr. Choi, the senile nosy neighbor Evelyn, and even Sharon Stone herself. The madcap comedy thrives on its stock characters and story but what really makes Cloned! pop is the vibrantly memorable score by Spiegel and Wolpow. The music is definitely an ode to the classic style with some of highlights including “Me and My Clone” and “Jorgensen”, the latter being one of the more hilarious moments of the show. Yet with a clever plot and amazing score, there is a lot of fluff that could be trimmed. All of the characters propel the action or story further with the exception of Fizz. Fizz serves as a comic relief, yet with such a colorful cast, Fizz could disappear and the result would still be the same. The ensemble has such a blast on stage with each other. 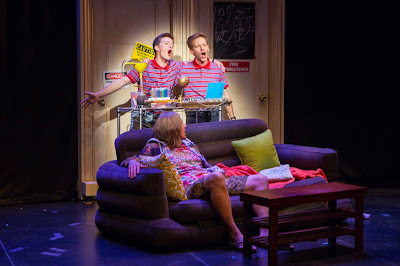 As Wally and Clone Wally respectively, Alex Goley and Eric Mann have exceptional chemistry. They play off one another so brilliantly, they truly carried the show. Mann has such a smooth, pure voice, he shined through his vocals and large characterization as Clone Wally. Goley’s sweet, geeky persona worked wonders as Wally. John Alban Couglan as Dr. Marshall epitomized evil genius. Crystal Kellogg as Sharon Stone portrayed the 90s hottie with great ease and hilarity. Her timing was impeccable, creating a wonderfully heightened version of the star. Cloned! is a wonderful take on farce and physical comedy. With the sadly limited set offered by Jason Simms, director Tom Wojtunik does a nice job in his staging, though some needed to be cleaned up as many visual sight gags were ruined as the actors had to pretend not to see the things that were in plain sight, one of which was Tramell and Clone Tramell. David Bizzaro’s puppet design is fun and cartoonish, allowing puppeteer David Andino much freedom to give Tramell life. Cloned! is an old fashioned musical comedy that makes you smile from start to finish. Will it be cloned for future life? Perhaps when it shrinks in size.